Agriturismo “Casa Greppo” is a beautiful stone country house on a hill, 450 mt high, by San Venanzo, in the most traditional and least known Umbria, halfway between Todi and Orvieto. Casa Greppo is part of “Podere Greppo” farm, 20 hectares (= 50 acres) of land, among olive trees, woods and fields of wheat and sunflower, in a dominating position from which you enjoy a wonderful landscape. In the foreground “Rotecastello”, medieval treasure with its sighting tower. Right round hills, valleys, multicolored fields and a lot of other small medieval villages, absolutely out of traditional tours. Casa Greppo, was an old farmhouse and it was carefully converted into four apartments, available for weekly, monthly or long-term rentals. Surrounded by garden, 600 sq. m/6500 sq. ft. of lawns, kitchen garden, a small orchard and aromatic herbs for cooking, reserved covered space and porches with tables, chairs and deck-chairs, Greppo offers to the guests a good level of privacy. 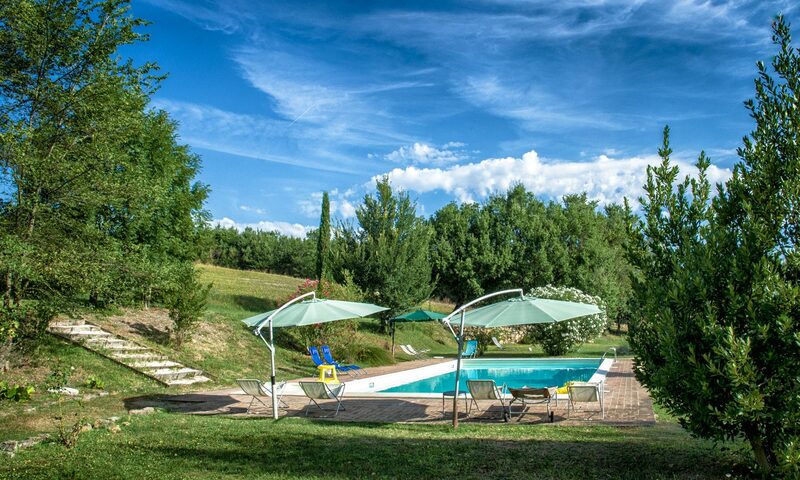 The private swimming-pool, 14 x 7 meters (about 47 x 22 ft.), is also surrounded by lawns, with a breathtaking view of Rotecastello, a small mid-age village; the panoramic pool area is also furnished with deckchairs and umbrellas for yr relax. The 4 apartments, all with independent access and covered terrace or porch, are comfortable, carefully furnished in order to make the guest feel at ease and daily stay with pleasure; kitchens are well-equipped with several supplies and each apartment has an independent heating system and air-conditioning system; moreover available on request, contacts with local activities for daily maid services, laundry services, guided tours and excursions, cooking services according to “Umbria” tradition. The nearest town is San Venanzo, at approx. 1,5 km (0,9 miles), where small grocer’s shops, a chemist’s, bars, newsagents’ and others facilities can be found. But when you are looking for a big shopping center, you can reach Marsciano, about 10 km (6,3 miles) away. Some reviews about us, read here! 60 sq. m/646 sq. ft., two bedrooms, one bathroom, sleeps 4. General services: linen provided, independent gas-heating, air-conditioner, washing machine, safe deposit-box, radio-CD player, internet WiFi. Outdoor private covered terrace with table, chairs and deckchairs, BBQ. 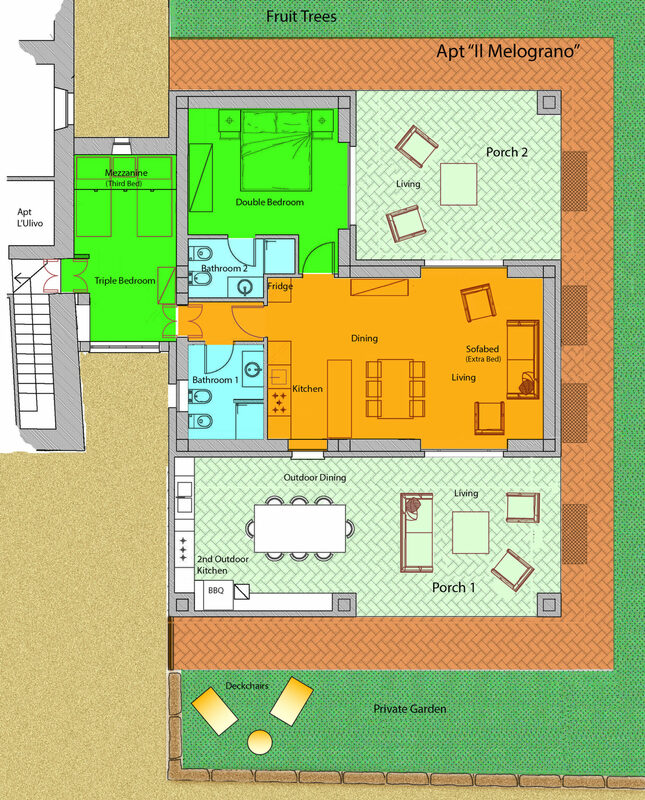 Ground floor: a large room with living area, dining area, kitchen corner and wood burning fireplace. Kitchen furniture dishes, cutlery, pots and pans, Italian coffee maker and other utensils, fridge, four-burner stove, electric oven, kettle, washing machine. Living Room area: sofa and armchairs, seating for 4/6. Dining room area: table and chairs, seating for 4/6. Bathroom 1, with basin, toilet, bidet, shower, hair dryer. Bedrooms 1 twin; 1 double with covered terrace equipped with table and chairs, seating for 4. 95 sq. m/1023 sq. ft., three bedrooms, two bathrooms, sleeps up to 8 (6+2 extra). Bedrooms three: one double bedroom suitable for disabled; one with double bed, one with double bed + 1 single extra bed. On request, an extra bed in the anteroom. 110 sq. m/1184 sq. ft., two bedrooms, two bathrooms, sleeps up to 6 (5+1 extra). Bedrooms 2: 1 triple with one double bed + single bed, 1 twin. On request, 1 extra bed. 85 sq. m/862 sq. ft., two bedrooms, two bathrooms, sleeps up to 6 (5+1 extra). It’s a new building located close to the apt “L’Ulivo”, with a beautiful view. The layout on this web page shows this area very clearly. The apartments “L’Ulivo” and “Il Melograno”, may be connected to each other and rented together, allowing them to offer hospitality to a large group or two families , always ensuring an excellent level of privacy. Let's talk, e.g., about Civitella dei Conti, a little village on the top of a hill that has got traces of a fortification, or about other small villages such as: Collelungo, Poggio Aquilone which gives the opportunity to make an excursion along the stream Fersinone, Montecastello di Vibio, little treasure seat of international summer stages of art and seat of the smallest and most active theatre in the world, Teatro della Concordia. You can also see Todi or the nature and fluvial park of Tevere river, or other parks like Trasimeno lake or the Piano di Colfiorito. But if you want go off you can reach and visit Tuscany over a single day: Arezzo, e.g., is just 100 km far, or Rome, just 150 km far. All this makes Greppo be an ideal starting point to visit the most fascinating places of center Italy. This kind of life, observed from above, from these valleys and little villages, seems to go by slowly and quietly, but if you want to reach those places, you suddenly realize that there is a lot of vitality everywhere. A lot of activities take place all through the year in the field of culture, of tradition and of tourism; international meetings, such as: the Spoleto Festival, the Todi Arte Festival, Festival delle Nazioni in Città di Castello, Umbria Jazz, common festivals animated by concerts, fairs and dances, where you can find the variety of the local cookery, with tasting of wild boar or truffle dishes, salami and all kind of barbecue, plays with historical local representations, costume dramas, local fairs which you can periodically visit in the old town centers of Perugia, Arezzo, Todi, Spoleto, etc. Casa Greppo Trail Maps, useful information and trails for walking, hiking, cycling and MTB. Air-conditioner available. Every apartment is equipped with an air-conditioner, located in the anteroom near the bedrooms. The Air-conditioner can be activated upon request, at € 8.00 per day. These offers are valid only on weekly stay during High and Medium season, and they are not cumulative. Check-in on Saturday after 4 p.m., check-out on Saturday before 10.a.m. Availability, disponibilità, disponibilité, beschikbaarheid, verfügbarkeit.